An American vigilante hacker -- who calls himself "The Jester" -- has defaced the website of the Russian Ministry of Foreign Affairs in retaliation for attacks on American targets. On Friday night, the Jester gained access to the Russian government ministry's website. And he left a message: Stop attacking Americans. "Comrades! We interrupt regular scheduled Russian Foreign Affairs Website programming to bring you the following important message," he wrote. "Knock it off. You may be able to push around nations around you, but this is America. Nobody is impressed." MID.ru is the official website of the Russian agency that is in charge of maintaining that country's international diplomacy -- equivalent to the U.S. Department of State. The message was projected onto a page within the ministry's archived website, not the main site's homepage. It was only visible by those who clicked on a link shared by Jester on Twitter. His hacking of the website included this gag: Visitors are subjected to the ear-piercing sound of an American civil alert message -- that shrieking dial tone that accompanies emergency weather broadcasts. A screenshot, taken Friday night, of the gag performed by the unidentified American online vigilante "The Jester." The U.S. government recently blamed Russia for meddling in American politics. Russian intelligence agencies have been accused of hacking into Democratic National Committee emails and the sites of other Democratic Party-linked organizations, leaking damning information to sway the election away from Hillary Clinton. Stolen emails have been taken by Russia and published by WikiLeaks. Russia and President Vladimir Putin have denied involvement. The Jester referenced Putin's denial in his webpage graffiti. "Let's get real, I know it's you, even if by-proxy, and you know it's you," he wrote. "Now, get to your room. Before I lose my temper." In the past, Jester has taken down jihadist websites, hacking into communication forums, and identifying potential terrorist threats. Ex-FBI agents have called him "the Batman of the internet." CNNMoney profiled this mysterious vigilante last year. 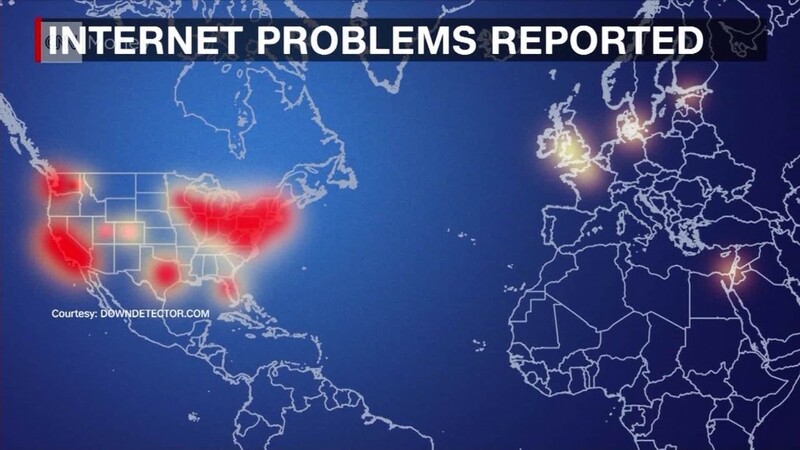 In an exclusive interview with CNNMoney this weekend, Jester said he chose to attack Russia out of frustration for the massive DNS cyberattack that knocked out a portion of the internet in the United States on Friday. "I wanted to poke them in the eye and stop feeling like US is just taking it on the chin. Again," he said. "I'm not gonna sit around watching these f----rs laughing at us." The Jester used a classic hacking technique, finding a hole in the website's computer code and injecting his own code into it. "It's 4 a.m. in Moscow right now and a weekend. I'm hoping they can't fix the hole til Monday," he said. As of 11 a.m. ET Saturday, the message remained online. Jester wants the Russians to take it seriously. He's not the only American hacker with this kind of capability. "Think of this as a professional courtesy," his public warning states. "Or if you prefer message from 'USA with love.'" On Sunday, Russian Foreign Ministry spokeswoman Maria Zakharova asserted that the government agency's main website was working "in normal mode." "We are talking about the old site, which is no longer in use," the Russian diplomat said in a Facebook post. 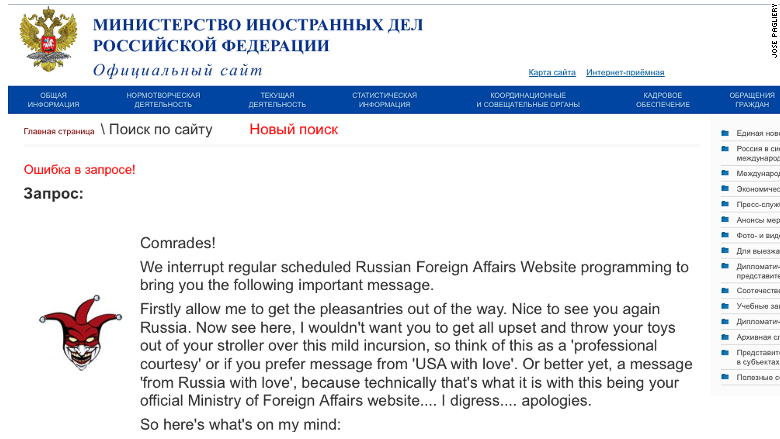 The Jester's message no longer appears on the Russian government's website. Editor's note: This story has been updated to clarify the nature of the Jester's attack.